The Sales Section has been designed to extend functionality for existing Admin and User access roles for customers that have full LRM. Two additional access roles have been added to allow the restriction of access to ONLY the Sales Section. They are Sales and Sales Admin and can be setup in the Portal by the Portal Admin. There are a number of Sales Dropdowns that can be edited and customised by Admins. Email templates can be configured for the Sales Contact section. The Wisenet Sales section is designed to manage the Enquiry and Opportunity stage of the sales lifecycle. 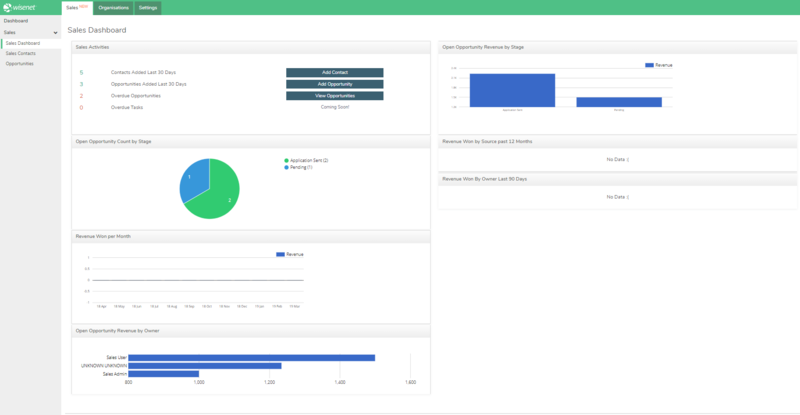 With insight into both the current and historical Sales activities on your Sales Dashboard, managing Enquiries through Sales is not only made easier, but it also allows you to focus on stand alone sales activities without interacting with other LRM sections. You can set up Sales Contacts and Sales Opportunity at the Enquiry stage. A Sales Contact is any person that your company markets, sells or partners with. They are the record in which sales activities are logged against whether it is a logbook or an Opportunity. Each Sales Contact requires a unique email address to prevent adding duplicates and simplify contact management with online enquiries. You will be alerted when adding a Contact with an existing email address. When viewing a Sales Contact, you will also see any linked Opportunities and/or Logbook Activities. The Sales functionality in Wisenet will help track business leads for your organisation through recording Opportunities. The Organisations section in Wisenet allows you to manage Agents and Workplaces. 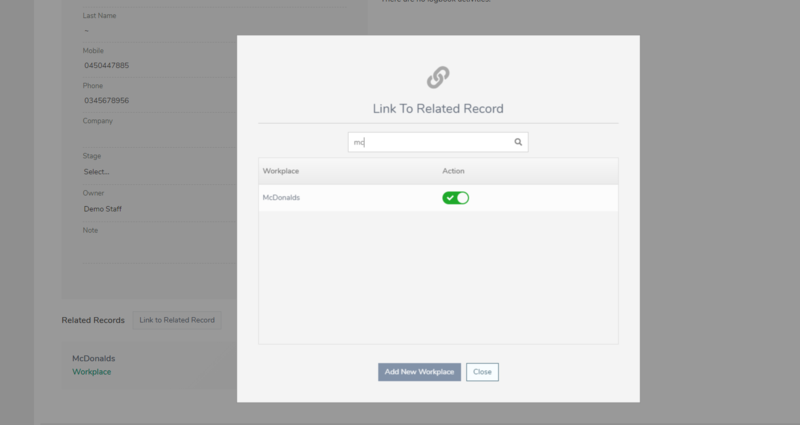 This allows you to link a Workplace Contact to a Workplace, an Agent Contact to an Agent, and a Sales Contact of type Learner to Learner Record. NOTE: Linking Learners is only available for user of full LRM with Non Sales role access. NOTE: When a Learner is added in LRM, it is automatically added as Sales Contact based on email address. We are working on a new Application Management stage that will bridge the existing Enrolment process with the new Sales section. Rather than creating an Enrolment for an Enquiry or Application, you will instead create an Application that will need to be Accepted or Rejected. Once an Application Status is set to Accepted, it will then become visible as an Enrolment. This will also allow us to simplify Online Applications directly into a Course Offer.